Butter an 11 x 7-inch pan (if using more than 4 breasts use a larger pan). In a bowl, combine melted butter with fresh minced garlic, 1 teaspoon garlic powder and salt. In another bowl, combine the dry breadcrumbs with 1/2 cup finely grated cheddar cheese, Parmesan cheese 1 teaspoon garlic powder and coarse ground black pepper. 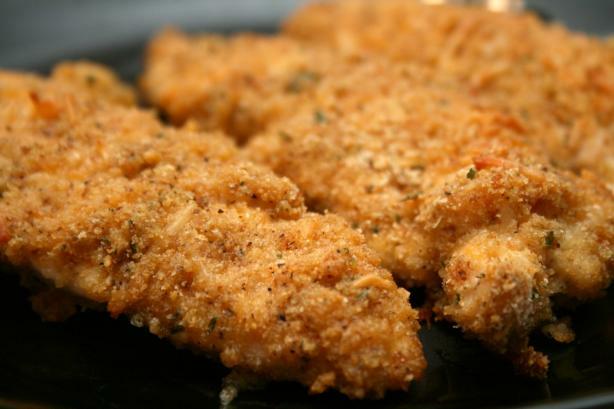 Dip chicken in butter mixture; then in crumb mixture. Place in prepared pan and bake uncovered for 35-45 minutes or until cooked through, larger breasts may take more time (placing the chicken on a rack in a pan will produce an extra crispy crust). Top with shredded cheddar or mozzarella the last 5 minutes of cooking (this is only optional.